We are really looking forward to what the car will do when we get it back out on the track. Stand by for updates on the Mustang. 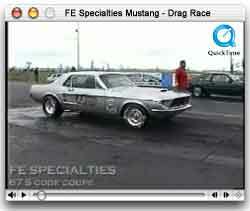 Click one of the links below to watch the FE Specialties '67 Mustang at the drag races. You will need Quicktime viewer to watch this video. If you need the viewer program, please click on the appropriate link below to get to the instructions on how to download the player. C4AE-G heads off a stock 390 Galaxie. They have been filled, high ported, with 2.09 and 1.75 Ferrea valves. Heads flow 323 Intake and 220 exhaust. 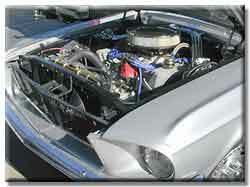 Holley HP series carb, 1000 cfm. 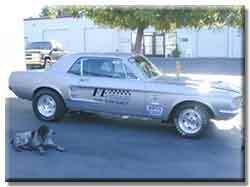 The car is painted the original Silver Frost Metallic with ’68 Maroon interior. Painted by River City Paint in Sacramento. Interior is by Tom's Auto Trim in North Highlands. 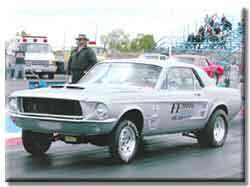 Jim Galatioto, owner of ATO Transmissions, built the C6 Trans. with Torrington bearings through-out to reduce friction drag. We have changed quite a few items since the last run, included are 4.11 gears, aluminum 9”case, and 28 x 11.5 x 15 tires. We also moved the battery to the trunk and installed an electric water pump. We changed over to a manual valve body transmission with a trans-brake. We also had to install a race seat, due to the fact that my head was going into the rear seat area when I was leaving off the line. The car weighed 3080 before the changes. This is with me out of the car. Now it weighs 3020.